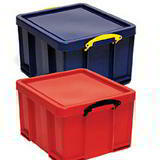 These Really Useful boxes really live up to their name! 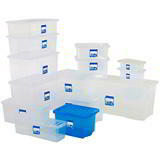 Ideal for use at home or the office, this is a comprehensive range of strong, stacking plastic storage boxes with lids, perfect for virtually any type of storage job. 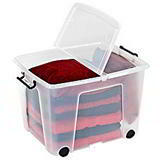 Each plastic storage box comes with a separate lid which locks securely into place to ensure conents are kept free from dust and moisture. 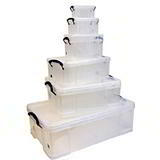 They are made from clear or solid coloured polypropylene and come in sizes ranging from 84-litre large plastic storage boxes down to ones which are just 0.3 litres big, but just the right size for storing business cards. 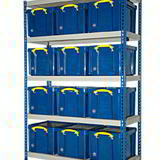 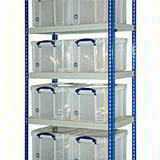 And if you want to get completely organised, why not get one of our storage bays, complete with either blue, red or clear really useful boxes?